This hotel in the Old Steine district that has food fit for a king. The Royal Albion succeeds in wowing families and food-lovers alike. Views of the Pier and the beach. An excellent family option located overlooking Brighton Pier. 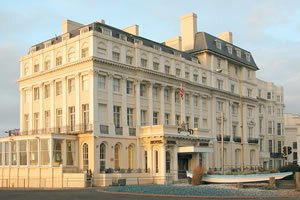 The Royal Albion Hotel comprises 204 stunning en-suite bedrooms and a restaurant with views over the English Channel. Specialising in traditional cuisine, Jenny’s Restaurant is guaranteed to satisfy even the most complex palates, whilst the Pavilion Bar and the Bar Rogue Cafe Bar are stylish bars providing good food and drinks and some terrific evening entertainment. This formidable establishment also offers first rate conference facilities with several function rooms accommodating up to 150 delegates or guests, many of the function rooms also benefit from air-conditioning. There are two syndicate rooms and a refreshment area.